VICTORIA, B.C. (May 2, 2017) – Pacific Links International and the Pacific Links Bear Mountain Championship Tournament Organizers are pleased to announce that Help Fill a Dream, a Victoria based charitable organization, will once again be the Official Charity Partner of the PGA TOUR Champions Event. After a successful partnership through the 2016 Event, raising over $80,000, both parties were keen to continue the relationship and build upon what was accomplished last year. The Pacific Links Championship and Help Fill a Dream teams worked together on the 2016 Event to implement various charitable initiatives to not only raise funds, but awareness for the organization and the important work that it does for kids and families on Vancouver Island. Canadian PGA TOUR Star Graham DeLaet, on-site for the 2016 Event’s junior clinic, surprised Help Fill a Dream with a $10,000 cheque to help the organization grant more kids’ dreams and continue their work with improving the quality of life of sick children. “Pacific Links is pleased once again to support Help Fill a Dream with their mission of making life better for children with serious illnesses. We sincerely hope our contribution helps in some way with the heartache and pain endured by these families. With generosity, we proudly support these families through this charity and hope you will join us in making a difference,” said Rudy Anderson, President at Pacific Links International. Since 1986, Help Fill a Dream has made over 2,200 dreams come true. The organization believes that dreams come in all shapes and sizes. For a child, it may be to become a princess or pirate, to meet their favourite celebrity, or to travel to some exotic destination. For the parents, the Dream can be as simple as being by their child’s side while they are sick in the hospital or making a comfortable place for them when they are home. Each dream is tailored to provide the child with the experience of a lifetime. Dreams can replace frustration and despair with hope that is so essential for a child’s recovery. Help Fill a Dream works closely with hospital social workers and other healthcare professionals to positively impact children and families who are going through a difficult time. The Event will once again be played at The Westin Bear Mountain Golf Resort & Spa the week of Monday, September 11th – Sunday, September 17th, 2017. Tournament week will commence with Official Pro-Ams on Wednesday and Thursday, where participating teams will play alongside a PGA TOUR Champions professional over 18 holes of premiere golf. Competitive action will follow with 54 holes of championship play from Friday to Sunday, with no cut. For information on corporate hospitality, sponsorship opportunities or group packages, please contact McKenzie Clarke at [email protected] or (647) 468-3500. Volunteer registration for the 2017 Pacific Links Bear Mountain Championship is also in full-swing. The team of volunteers consist of avid golfers, fans of the game and people looking for a fun and exciting experience. To learn more or register as a volunteer, visit www.PacificLinksChampionship.com and click on the ‘Volunteer Tab’. The Pacific Links Bear Mountain Championship is an official event on PGA TOUR Champions featuring the world’s premier golfers aged 50 and older competing for a US$ 2.5 million purse. Tournament play at the Pacific Links Championship will be held on the Jack and Steve Nicklaus Co- Design Mountain Course at Bear Mountain Golf Resort in Victoria, British Columbia, from September 11-17, 2017. All three competitive rounds will be broadcast live by Golf Channel to more than 200 million homes in 84 countries and 11 languages around the world. Help Fill a Dream inspires hope, healing and happiness in children with life-threatening conditions. Help Fill A Dream makes Dreams come true, improves the quality of life of sick children and assists families with care and financial support. Since 1986, Help Fill A Dream has touched the lives of 2,245 Vancouver Island and Gulf Islands’ children and their families. PGA TOUR Champions is a membership organization of golf’s most recognizable and accomplished players, age 50 and older, including 32 members of the World Golf Hall of Fame. The Tour’s mission is to provide financial opportunities for its players, entertain and inspire its fans, deliver substantial value to its partners, create outlets for volunteers to give back and generate significant charitable and economic impact in tournament communities. In 2017, the PGA TOUR Champions schedule includes 26 tournaments in 18 states, Japan, Wales and Canada, with purses totaling more than $55 million. The Charles Schwab Cup, which includes the Regular Season and the Charles Schwab Cup Playoffs, is used to determine the season-long champion. All events are televised in the United States, with most receiving complete coverage on Golf Channel, the exclusive cable-television partner of PGA TOUR Champions. Internationally, telecasts air live, tape-delayed or in a highlights-package format in excess of 190 countries and territories, reaching more than 330 million potential households. The PGA TOUR’s web site is PGATOUR.COM, the No. 1 site in golf, and the organization is headquartered in Ponte Vedra Beach, Fla. 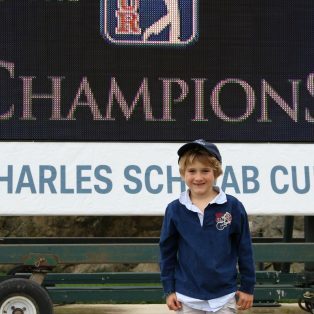 Follow PGA TOUR Champions at facebook.com/PGATOURChampions, on Twitter @ChampionsTour and on Instagram @pgatourchampions.